Why is our universe about to decay? 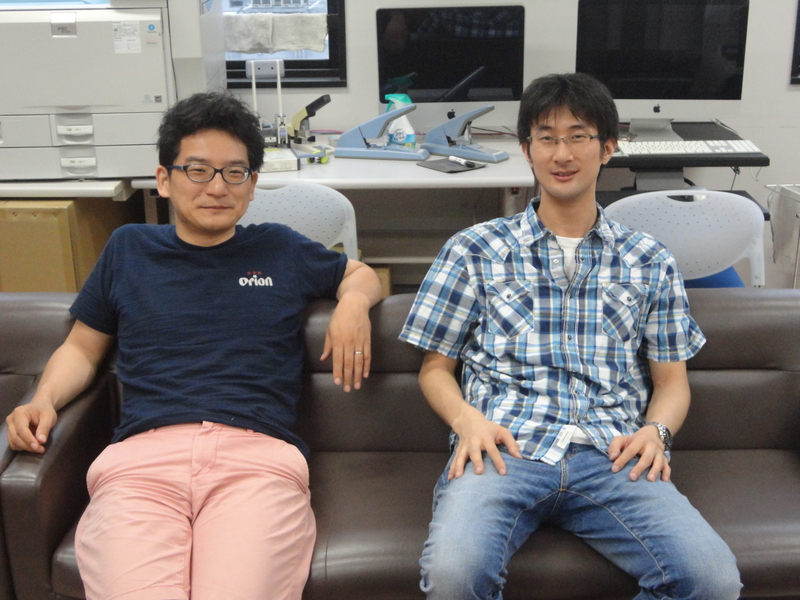 Dr Kin-ya Oda (left, Osaka university) and Dr Masatoshi Yamada (right, Kyoto university). It has been revealed that we are living on the edge of vacuum instability by the discovery of Higgs particle at the Large Hadron Collider since 2012. The determination of Higgs mass finally provides the last-missed parameter, the Higgs self coupling, to be 0.12 in the Standard Model of particle physics after nearly half century of its foundation. This value completes the initial conditions for a set of differential equations, called renormalization group (RG) equations, which govern how particles interact at very high energy scales. It turns out that the self coupling can vanish or even become negative at the Planck scale, where the quantum gravity effects become significant. We note for later reference that the Yukawa coupling between the Higgs and top quark plays a crucial role to reduce the Higgs self coupling in its RG evolution. The Higgs potential is about to become unstable for the field value of the order of the Planck scale. This is important for us because it implies an apocalyptic future that we may suddenly be swallowed by a bubble of Planck-scale vacuum which expands with the speed of light and that all our constituent atoms will be destroyed, if the Higgs self coupling is slightly negative for a field value around the Planck scale. Schematic figure for the RG flow in the theory space. See the paper for more details. Copyright 2016 IOP Publishing Ltd. Indeed this situation of vanishing self coupling has been predicted in the context of the asymptotic safety by M. Shaposhnikov and C. Wetterich since 2010 well before the Higgs discovery. 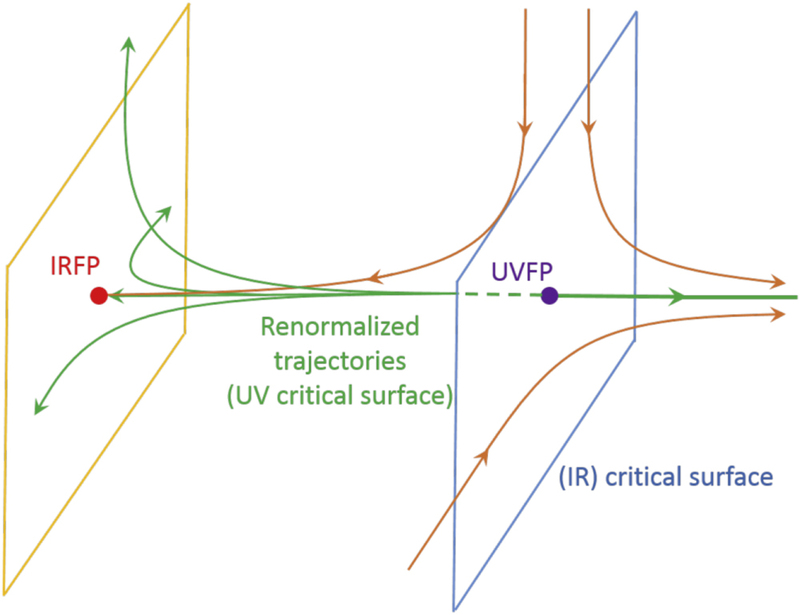 The idea of asymptotic safety has been first proposed by S. Weinberg since 1979 that the divergences in quantum gravity may be renormalized by requiring that the theory is defined on the ultraviolet (UV, meaning “high energy”) critical surface, which is defined as a set of RG flows (solutions to the RG equations) that are drained towards a non-trivial UV fixed point as we raise the energy scale; see Fig.1. The UV critical surface is a finite dimensional subspace in the infinite dimensional parameter space of the non-renormalizable quantum gravity, and hence the theory is defined by finite number of parameters. The self coupling turns out to be irrelevant, and hence becomes zero on the UV critical surface. We have seen the tremendous progress in cosmology during the past quarter century. Just a few parameters in the Standard Cosmology, two of which are from inflation, perfectly fit the hundreds of data points in the fluctuation of the cosmic microwave background observed by the Planck satellite. We know for sure that there has been a cosmic inflation. To cause it, we need a scalar field. The Higgs field is the only elementary scalar field that has been confirmed to exist by human beings. Therefore it is tempting to pursue the idea of Higgs inflation in which the Higgs field causes the inflation due to the large non-minimal coupling between the Higgs and gravitational fields. In this regard, it is important to take the non-minimal coupling in the analysis of the asymptotic safety, as well as the Yukawa coupling mentioned above. In this paper, we have studied the asymptotic safety in a simplified Higgs-Yukawa system that is non-minimally coupled to gravity. An important observation is that the inclusion of quantum loop corrections from a fermion, corresponding to the top quark here, makes both the Higgs mass-squared and the non-minimal coupling irrelevant. It means that these two parameters are dependent variables that are determined by other gravitational coupling constants in principle. This result may have profound impact on the so-called hierarchy problem of the Higgs mass. The problem states that if the Standard Model is valid up to the Planck scale, the loop corrections to the Higgs mass-squared is cut off by the Planck scale and that there must be fine tuning of 32 digits between the bare mass-squared and the loop corrections. As the Higgs mass-squared may not be a free parameter anymore under the asymptotic safety, the solution to the hierarchy problem may be intrinsically built in the gravity. This entry was posted in Author Insights, IOPselect and tagged quantum gravity, spacetime by Jennifer Sanders. Bookmark the permalink.